Admin users may create as many new, custom tags as needed. Simply navigate to the Settings menu, select the Data Management tab, and then click on Manage tags. Any user may access the tags screen from the Configuration menu, but only Admins can create new tags. On the main Tags screen, look for the Create a Tag button in the upper right. 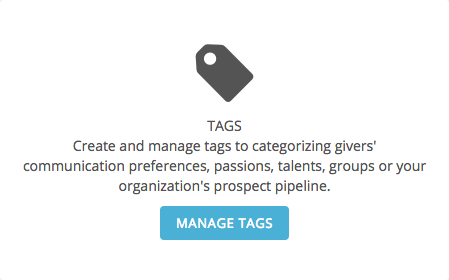 Then, you will need to select a tag category and provide at least a name and description for your new tag. Users will also have the option of entering an abbreviation, expiration date, and minimum giving level; these fields are information only, and do not create automatic Tagging rules. To automate Tagging, users will need to create a new workflow using Virtuous Automation. Users with MailChimp or SendGrid integration will have the added option of syncing their new tag to an existing list in one or both of those respective email platforms, in order to manage subscriptions to specific mailing lists.